characters was ‘Ishigami’ or ‘Isono-kami’. Buddhism back in the Kofun Period 250-538). 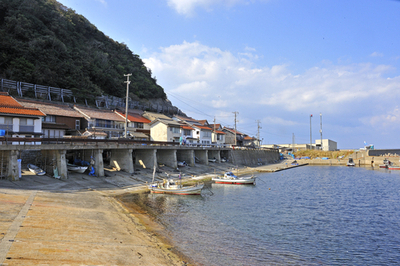 Located on the west side of Shiotsu-ura, Kama-ura also has a shrine of the same name ‘Ishigami-Jinja’. 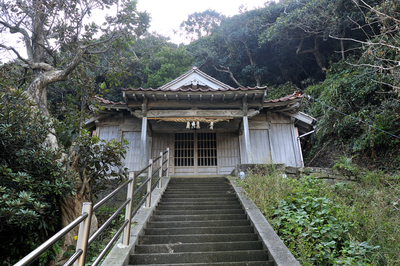 According to records, during the Muromachi Period, the daimyo Ouchi Yoshitake fled here with his family. Such was his attachment to the shrine that he was instrumental in developing it and worshipped here deeply. In terms of size, it’s referred to in the Izumo Fudoki as being ‘180m wide’. Heading past Kama Harbor one will come to a steep hill where the road separates. Heading right towards the wind turbine area takes you to the Uppurui Bay Kozu Shrine. Going left will lead to such a hilly road that will make you wonder if there is even a road ahead but will finally lead to a winding road that goes down to the beach. Going left 300m from here will take you to the Kita Hama Community Center. Take the opposite route to the right and you’ll end up at Kozu Shrine in Uppurui Bay.